A Boulangerie at the end of a street in the old town of Montpellier in the south of France. It began some years ago on our honeymoon, this dream of not only visiting the South of France but living a life here too; a rich life with children, good food, a new language and all the romantic notions about France itself. When you think of France what pops into your mind? Is it the wine, cheese, food, 35-hour work week? France has a universal reputation for all of the above and more. And that reputation is still largely justified. The French take some things very seriously—food and a certain way of life. Their language is extremely important to them and for good reason. It is a beautifully complex and nuanced language that adds a lyrical touch to the everyday. These were our reasons for wanting to live here. And thankfully what we’ve found hasn’t disappointed us; rather the friendliness and encouragement have been more than expected. The idea of the French being haughty and elitist does not ring true down here in the South of France. Perhaps in Paris you will find such attitudes, but Paris is, after all, one of the world’s largest cities. For the most part, we have found kindness in all our dealings with people even with the scant knowledge use of the language. And now here we are—a family of five living on the outskirts of the culturally and intellectually stimulating city of Montpellier, the seat of the Languedoc-Roussillon region. It is a university town with all the richness and buzz of youth while retaining its southern French charm. The men still come out for their afternoon-long matches of “boules,” schools and businesses have two hours for lunch, and all stores, other than a few grocery stores that open until noon, are closed for business on Sunday. Our children are young, ages eight, six and two, the perfect age for such an adventure. We decided that to put them in a bilingual or English school would be a mistake if we wanted to truly live here and give them the gift of another language while their brains are still open to absorbing one. This decision was not made overnight nor was it without its share of worry. I worried about all the things that perhaps you would worry about too; would they be happy, would they actually learn anything or be left behind in the curriculum because of the language, would they make any friends, would they come home crying, dejected and lonely, would they hate me forever for doing this to them? I am happy, well more than happy, I am thrilled to say that not a single one of these worries has been remotely near to the reality of the actual experience. If I can offer anyone just one piece of advice it is this: children are resilient and they will be happy if they feel loved, valued and supported. My children have truly amazed me and I know they are not unique in the way they’ve taken to another culture and language. Of course, it helps that our local school is nice and the teachers are warm and welcoming but I can’t believe that that is unique to my experience either. 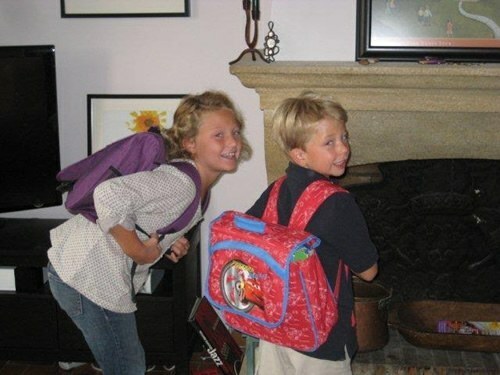 Two of the author's children sporting backpacks for school. You will hear horror stories about French public schools. How the teachers never praise, do not use positive reinforcement, always push harder on matters that might seem ridiculous to the average American public school family. What I have found is that my children’s French teachers are serious about their jobs and the progress of their students and so push them to excel. Teachers offer specific and detailed encouragement. Some things that may seem silly to some expatriates but are of tantamount importance in France, such as handwriting, are taken seriously because they are an aspect of the child’s daily school life. It is a foundation for attention to detail, respect for learning, and pride in one’s work. The difference in my 6-year old son’s handwriting is more than impressive since moving here. He writes beautifully and in perfect French script—a cross between our cursive and calligraphy—and while this may perhaps serve no purpose in later “life,” it serves him well at school because he has improved, feels accomplished, practices motor skills and control, and earns “très bien” (“very good”) compliments for his work. You would think that because we had dreamed of a life in France for 13 years that we would be fluent in French. Or at least that we would have studied French in college. If nothing else, we maybe would have brushed up on the basics we had learned from high school with a dictionary or a computer course. But we had not. When we moved here nearly one year ago, I personally had no knowledge of French other than counting the numbers to ten, a few colors and key phrases, mostly pertaining to navigating a menu and communicating at restaurants. Was I silly? Was I scared? No and yes. I began French lessons as soon as we arrived and have been able to piece together enough to get by; and getting by means many things, from enrolling the children in school to ordering a Thanksgiving turkey from the butcher. Daily school collections, French television, 3rd-grade French homework along with two big kids who rattle away in French while playing “l’ecole”’ have buoyed me and given me the push to get out there and actually dare to speak. At times it can be frustrating, isolating and lonely but the excitement and thrill of learning a new language more than makes up for any of the negatives. 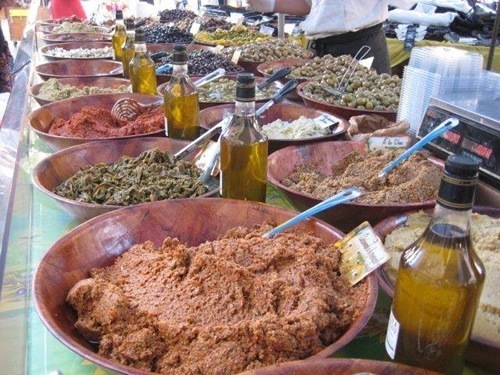 Salads, olives, olive oil and other tastes in a stall of one of the many markets in the south of France. Photo by Aidan Larson. I cannot write about life in France without mentioning the food. It is such an integral part of the culture and lifestyle that it has to be addressed. Eating is viewed in a much different way here than in most Anglophone countries. For starters, there are not very many fast food restaurants. Yes, there are some, one very famously American where children and teenagers all love eating, but in general the big meals are eaten at home, usually for lunch, and always seated, served in courses and savored. Eating is a communal experience here where time is taken to talk and relax as well as nourish. The food is simple but mostly seasonal and freshly prepared. Breakfast is small, lunch is big, there’s an early afternoon snack mostly for children called a “gouter”’ (to taste) and then dinner is on the small side and served after 7 p.m. There is very little snacking in between meals, especially by women. Most lunches consist of at least three courses—entrée, plat, and cheese or yogurt and fruit. If it is the weekend there will always be wine but never more than a couple of glasses. Excess is not the way to go in France, with quality over quantity being more the norm. I do have to say a word about chocolate though. There is an impressive array of chocolate cereals, candy, cookies and baked goods here. And chocolate milk is a mainstay served warm and in bowls for slurping. Children eat most of these items for their snack in the afternoon. There is a vast quantity of chocolate consumed here, yet somehow very little trouble with childhood obesity. One final note on food, my favorite subject, is the quality of school lunches. Each day from noon to two (there’s no school on Wednesday) the cafeteria or cantine serves lunch. Children can stay at school or they can come home for the 2-hour break. Mine love staying because school lunches are so good; so much better than what I can prepare in the middle of the day. The children are all seated and then served at their table. There are four courses, real plates, napkins and flatware, and they can raise their hands for seconds. My emergent foodie daughter was beyond delighted. Usually, the first course is a salad of sorts, beets or radishes, pasta, or greens. Then they have their main course, my kids’ favorite is veal cordon bleu and peas, followed by the cheese course which can be yogurt on some days and then finished with a dessert such as chocolate mousse, fruit, or applesauce. You can imagine what the favorite dessert might be. Imagine eating like this at school, having sit-down meals ingrained in you from school age, learning table manners properly and eating well as part of your school day. This goes a long way in explaining why the French are the way they are about meals and food. It is a life lesson that I am pleased for my children to learn. Living in the South of France is a reality that at times still feels like a dream. There are frustrations and complaints the same as anywhere, they are just not the same ones. At times it is lonely and tiring to be on the edge of a culture and language but the warmth and encouragement of the people here have surprised me. They continue to support and engage our family with patience and no small amount of curiosity. The Mediterranean Sea is close by and while too calm for surfing, its beaches are perfect for a family day. In the summer months seasonal restaurants called paillotes are erected on the beach and vary in price and formality with lounge chairs and beach side service. Being as it is close to the Spanish border, there is a culture of bullfighting and cowboys in the region. They don’t kill the bulls here but do have bull runs and festivals during the summer months at local arenas where bullfights end, rather than in the bull’s death, in the bullfighter jumping into a pool of water. These are called “toro piscine,” or bull swimming pools. The region produces the most wine of France and it is also the least expensive, for now. Popularity and quality of Languedoc wines is on the rise so it is advised to get the good vintages now while prices are still good. A well-known vineyard in the area is Peuch-Haut and their reds are delicious. Having over 300 days of sunshine a year means there is never a shortage of outdoor adventures. You can hike, bike, ride horses or walk as well as take the car and meander through the Pic St Loup wine area stopping off at whichever vineyard strikes your fancy. The proprietors are happy to let you taste and you can leave with a bottle of two for your collection. Boules, the retired French man’s favorite past time is alive and well here. Every day the men, and sometimes their wives, come to the park across the street carrying their small bag of three metal balls. It is somewhat like horseshoes and curling combined. These men spend hours after lunch, throwing their metal spheres underhanded trying to get theirs closest to the marker, and if not, trying to knock someone else’s further away. For information about moving to Montpellier and the surrounding areas, Wendy Johnson cannot be matched for her knowledge and prompt assistance: www.moving-to-montpellier.com. Aidan Larson is an American mother of three navigating her way through her family’s new life in France.